Our masterplan proposals begin with a thorough understanding of the existing conditions and history of the site. Appreciating the needs of existing communities is critical to the success of a masterplan. Often the familiar aspects of a place are resonant and should be re-embedded within new proposals. The process of working with variation within a masterplan, has become more refined in our practice through its work in large-scale housing projects in the Netherlands, where architectural ambition is high and costs are strictly controlled. It is also important that for a project with a proposed evolution over time, that the architectural expression is sustainable and repeatable. We recently designed a scheme for Proper Stok Woningen bv, comprising 150 apartments in Amsterdam in five buildings that were built in two phases. Again whilst the forms of the different blocks alter in response to aspect and views, the material palette is restricted. This not only gives coherence to the final stage of the master-plan, but also has financial benefits for the client as maintenance is made simpler and more cost effective in the future. The approaches that we develop in our masterplanning work also translate to the scale of buildings within masterplans. For example, our project Solid 11 on Constantijn Huygensstraat in Amsterdam develops a mixed-use building that can accommodate varied uses over time as the needs of the neighbourhood change. Housing, offices, commercial or hotel uses can all be accommodated within a building with a distinct urban presence and sense of place that has been arrived at through the use of massive load-bearing pre-cast façade elements. This constructional solution gives the building a permanence that resists alteration to facades by occupiers over time, but allows large structure-free floor plates that can be endlessly reconfigured as uses change. 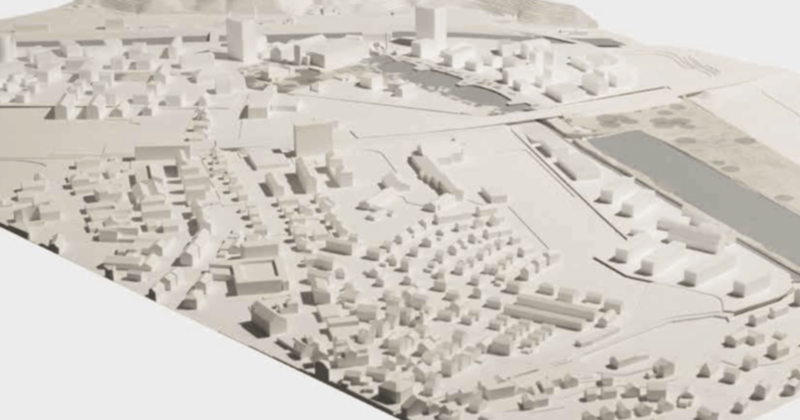 Jenny Areal is a development plan, won in competition, for the land and buildings of the Jenny Fabrics AG in Ziegelbrücke Switzerland. A range of buildings, including the owner’s villa, well proportioned industrial buildings and an historic barn sit in an immediate landscape made dramatic by areas of water, the proximity to the local village and the surrounding mountains. The site is over 1km from north to south and consists of three distinct areas, open agricultural fields to the north, the industrial buildings and accommodation to the centre and open parkland and lakes to the south. Our plan sets out a development approach that can be implemented in stages by different architects over the coming 50 years, and provides the rules for scale, identity and response to the different qualities of the location. Where buildings are situated in open fields they embrace views of the mountains and are arranged around a long park at the centre of the site. Where new buildings are added to the existing industrial areas, they are scaled and detailed to match, adding density to existing building ensembles, and forming new town squares and public spaces. The outer edge of this dense Industrial centre is bounded with landscape making connections to the valleys and mountains beyond. Where they are near the existing village their scale and function are domestic and they are carefully arranged to maintain visual connections from the village to the landscape. The three different parts of the scheme are joined through a new landscape proposal, called ‘The Emerald Necklace’, that connects the development to the railway station and the surrounding countryside, containing mineral pathways and cycle routes, open parkland and large planted areas. By managing car routes and underground parking the central open spaces of the development are made safe and pleasurable for play, walking and cycling. 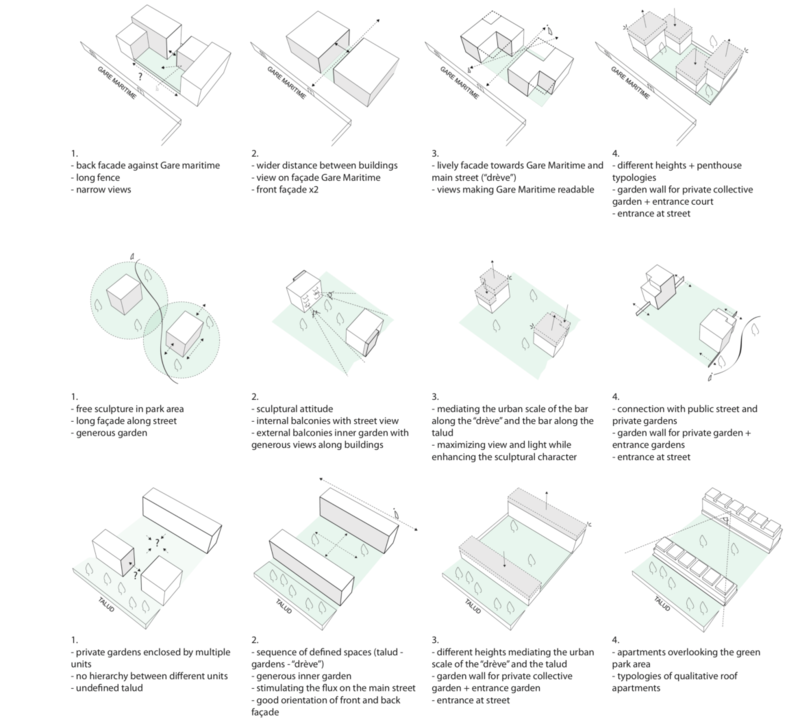 The illustrated work is in our view the first step in the design research towards the creation of an inclusive 21st century, sustainable and lively neighbourhood. It investigates on the potentialities of the given masterplan, it proposes the embryo of a built quality plan and it shows the way of operating to create a realistic but ambitious development. This research can be used in the design of the future development in collaboration with city and regional authorities and developers. It registers the sensibilities that our team handles in the approach of this development and offers the flexibility to amend it following arguments put forward through future collective discussions. 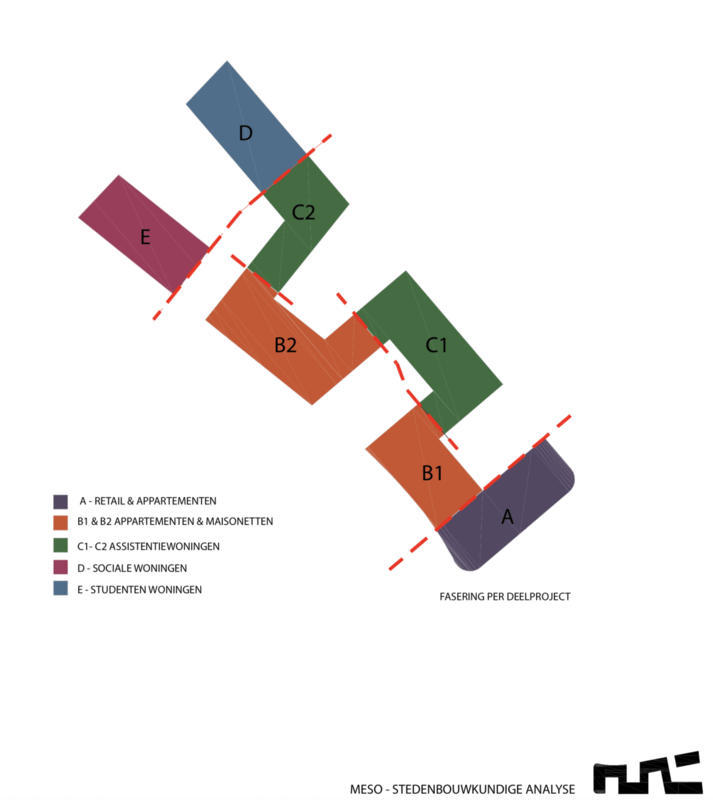 Masterplan for a large mixed use development in Belgium. 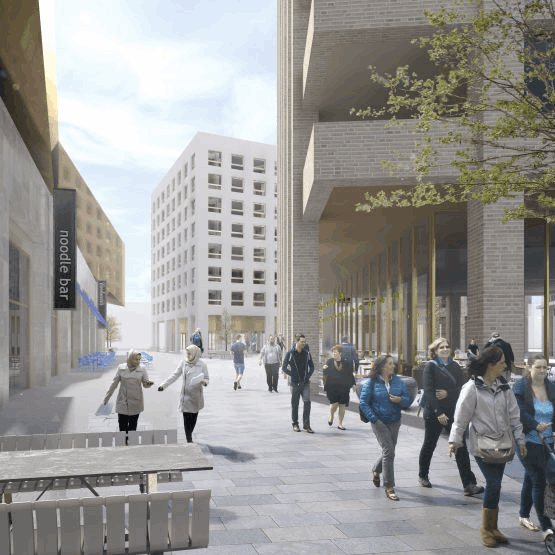 The project is set on the site of the former CIAC garage, amd the masterplan had to take this into consideration. Dunant gardens comprises 145 apartments and 52 assisted living residences, retail, small commercial and office/practice units. The scheme lays out a ribbon of accommodation that considers daylight, creating courtyards that are enclosed by acoustic screens. 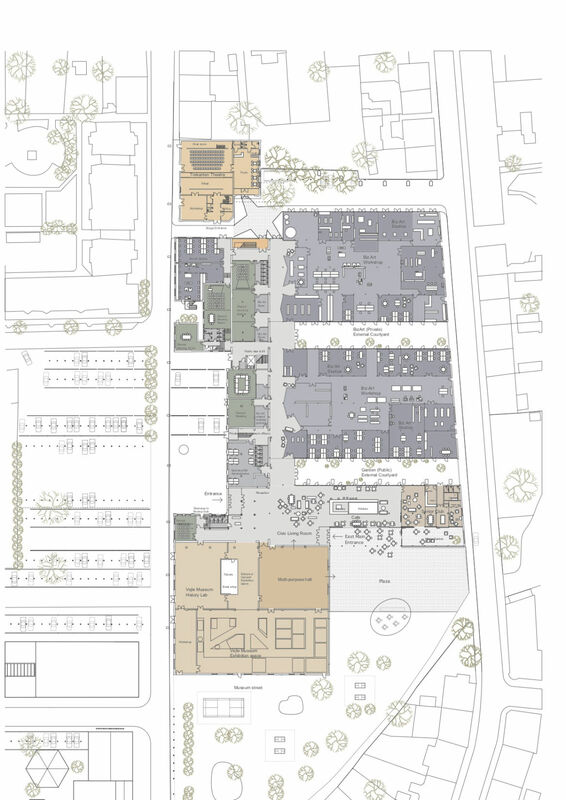 Cultural led masterplanning proposal for the re-use of an old spinning mill site. The key intervention being the proposed demolition of part bays in order to make the largest building occupayable by small groups without it seeming empty. Our scheme was selected for development, with a local team being selected to actually carry out the project. Holton Lee is a charitable trust for disabled people and those who care for them, which works to empower them by art therapy, contact with nature, personal counselling and spirituality. Its activities take place at the extensive Holton Lee estate in Dorset on the South coast of England, using the forest and agricultural land there and its range of houses and buildings that include a guest house for disabled people and their carers. Holton Lee Trust commissioned a study from us for four new buildings in which to develop their program: Faith House for spirituality, gatherings of people and art exhibitions; a studio building for artists, a small performing arts centre and an archive building where artworks and publications made by disabled people could be collected and studied. 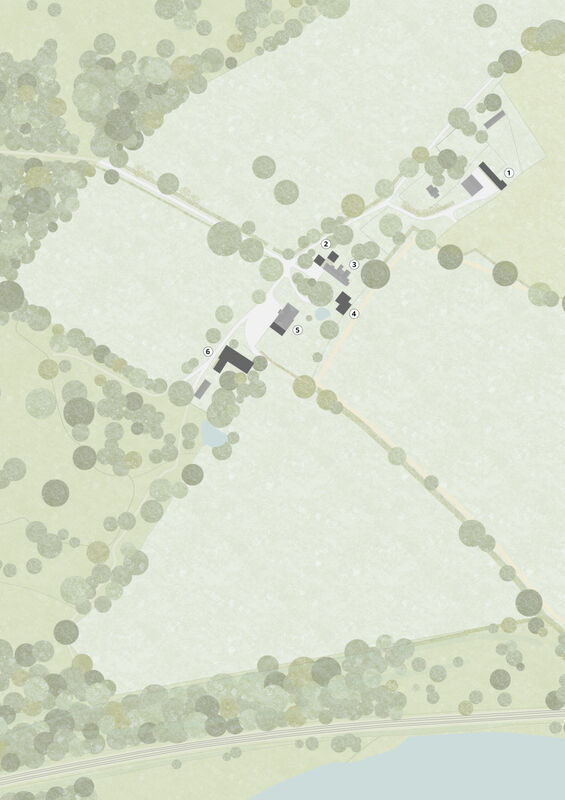 We made a prelimnary design for each new building and a simple master plan of where they could be situated to connect or intereact with those already in use. Provisions for accesibility across the land and in the bulidings by people with physical disabilties, were designed so that they would be inconspicuous and experienced simply as acts of generosity for people of all abilities. The masterplan requires that buildings are a single storey high, inexpensive and of simple, low-maintenance construction. Each has broad relationships to Holton Lee and the wider landscape, and more detailed connections with the particular character of the ground around it. As a whole the new buildings are intended to give meaning and intelligiblity to the original ad-hoc arrangements. For the site at Teville Gate there was a resolution to grant planning permission for a large and complex mixed-use scheme of over 600,000 square feet, that with car-parking, gave a gross development area of 950,000 square feet. This accommodation was arranged as a large ground filling plinth 26.5m high from which a pair of residential towers grew. The tallest tower was 25 storeys (80m) high. We have sought to radically simplify the scheme whilst maintaining its mixed-use programme of leisure uses and residential apartments. Our design proposes a family of four related towers each with its own identity ranging from 10 to 15 storeys gathered around a se- ries of new public spaces at ground level addressed by restaurants, a health club and a doctors surgery. This family of towers and the urban spaces they enclose are sheltered from the main road (A24) into Worthing by a leisure building that provides foodstore/restaurant use at ground level with a cinema and hotel above. A long student residential block completes the group of buildings by enclosing the northern extent of the site and masking the view of the unsightly tax office. Our proposal achieves a scheme of approximately 500,000 square feet plus one level of below ground car-parking giving a gross development area of 625,000 square feet.